"A fire started in the varnish room of the Wakefield Reed Chair factory on Saturday, July 21st at 7:58 a.m. 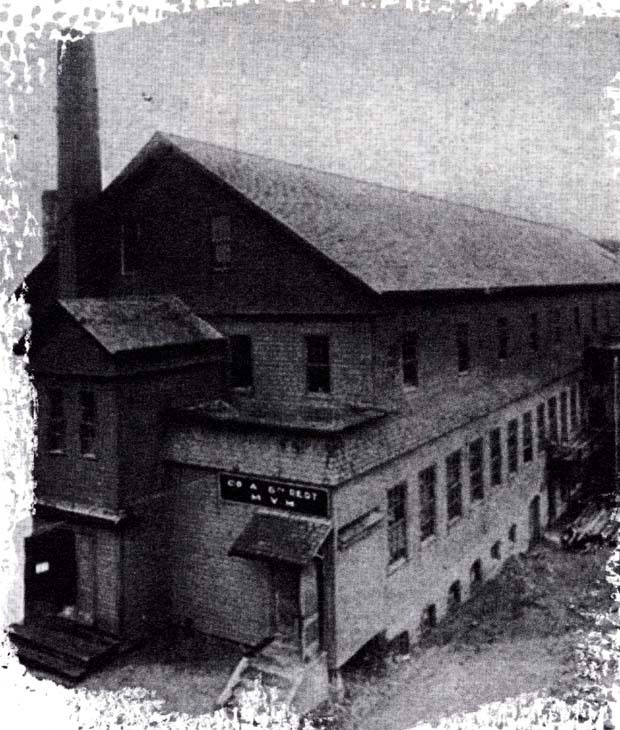 The building, owned by Emma Osgood, housed the factory, as well as the Wright & Dennis tennis factory which occupied the top floor of the building. Known as the 'Old Rink Building' it was once home to a roller skating rink from which it got its name, and was the seventh home of the Richardson Light Guard Armory, from 1877 to 1895. The Guard was ordered to remove all state property from the building when an inspection deemed the armory unfit for use in 1894. The fire was 'doomed from the start' and assistance came from three surrounding communities: Stoneham, Reading and Melrose. 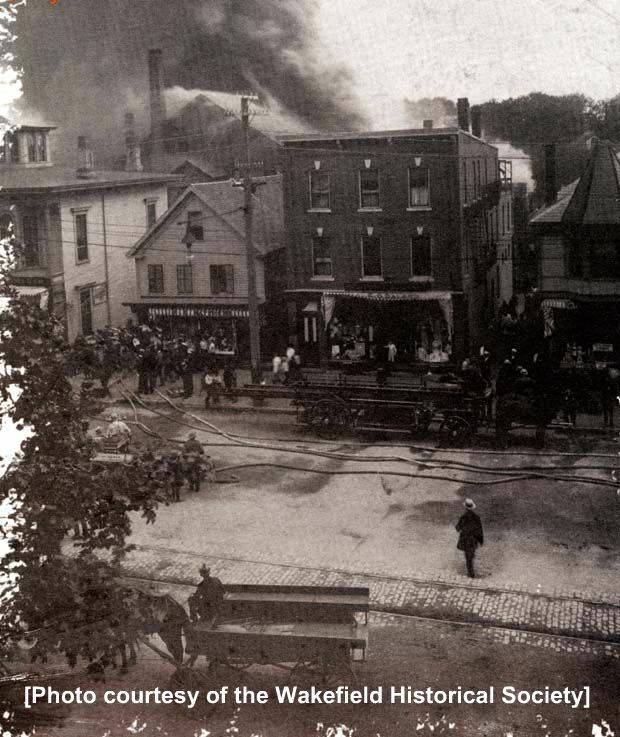 The fire destroyed the building, as well as Roger Howard's Carpenter Shop, a tenement occupied by Mrs. Abby Hawkes and family, two stables and a shed. Homes on Crescent Street were blistered and scorched and many families along Main Street and Crescent Street removed their furniture from their homes as a precautionary measure. The steeple of the First Universalist Church was destroyed, as was the roof. At the height of the fire, a southwest wind carried shingles 'high in the air.' The Saturday edition of the Wakefield Daily Item reported that 'some of the burning fire brands were carried to Lynnfield Center' where it was said they landed on the roof of a home. Although the building was assessed at $7,000, a total damage of all affected properties was estimated at $90,000." -- Text from calendar by Jayne M. D'Onofrio. 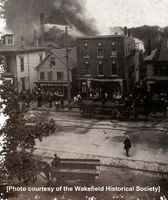 “Rink fire, rear of 390 Main Street, July 21, 1900,” NOBLE Digital Heritage, accessed April 20, 2019, https://digitalheritage.noblenet.org/noble/items/show/6844.